Through ongoing development, Colorado lost the equivalent of one football field of open space every 2 ½ minutes during a recent decade, per researchers at Colorado State University. Natural habitat being lost for many types of wildlife puts pressure on our urban landscapes to help fill the nature gap. More and more, our landscapes are becoming habitat. With this being National Pollinator Week, it's a good time to think about bringing more pollinators into our yards even if our outdoor space is a few square feet of patio. Pollinator friendly landscapes, container gardens and even hanging baskets on apartment balconies can put out the welcome mat for pollinators. 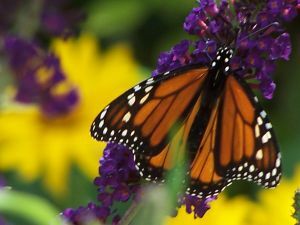 Though we may not realize it, many of the flowering plants we typically find at garden centers or are already growing in our yards are pollinator friendly. We need to plant more of them and make sure there is enough variety that will appeal to all. Providing more plants that offer nectar and pollen throughout the growing season is key. Flowering shrubs and perennial flowers are best for planting in the ground as they may not overwinter in a container. Columbine, liatris and coral bells, for example, attract hummingbirds. They also offer the ease for the gardener of coming back again year after year. If you love growing herbs for the kitchen, plant basil, mint, rosemary, sage and thyme to attract bees. Fruit trees such as apple and pear and berries such as raspberries and strawberries also attract pollinators.